Shaw Music Studios has two recording studios: "Studio A" and "Studio B". Studio A is the larger, full service Studio. 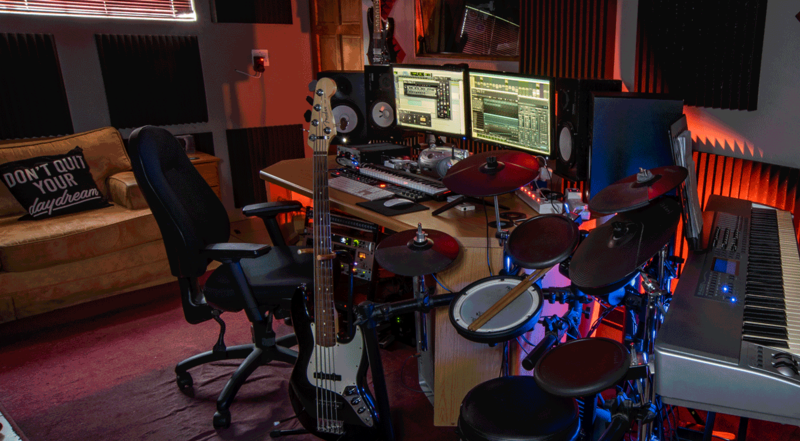 It is multifunctional, catering to solo artists, bands, live instruments and voice overs. Jonathan G. Shaw is the lead engineer and producer in this Studio. Studio A's facilities include a control room and studio area. The control room (also known as "the crib") houses the super computer, musical instruments, keyboard, studio monitors, pre-amp and headphone amp. It is the heart of technical operations in Studio A. Built for comfort, the studio area in Studio A (also known as "the boom box") is spacious as well as very functional. In contrast to the control room it has a funkier look and provides an ideal acoustical space to accurately record. and Behringer C-2 acoustic mics. and Yamaha nylon 6-string guitar. The rooms are acoustically treated with top-of-the-range Auralex Studio Foam which provide an incredible look and sound as well as out-of-this-world Modular Muse 400DIA MuseTube bass traps.